Spring is just around the corner - honestly fellow Canucks - it is! Grapefruit and Cactus Leagues, in Florida and Arizona, have fired up and first pitch of a new Major League Baseball season is just 37 sleeps away. A National League tilt, Cubs vs Marlins, kicks off the new campaign as Chicago visits Miami at 12:40 PM ET on March 29, 2018, at Marlins Park in Florida. After 2,430 regular season contests, plus four playoff rounds, the 114th World Series Champion gets crowned in late October. Online sportsbooks, including SportsInteraction, are all over the 2018 MLB season as their betting boards are littered with NLCS, ALSC and MLB Championship futures odds. Season team win total props are also posted and spring training exhibition odds will be up soon. A full slate of X-Games hits the diamonds on Friday, February 23, 2018. Will the Houston Astros be the first back-to-back Champs in 18 years? With plenty of both - here are your Fall Classic contenders and pretenders. Bookmakers Note: LIVE odds and results will appear here once the 2018 MLB action begins. Anyone remember when Houston had a problem with a 51-111 regular season record? It wasn't that along ago (2013) so hope springs eternal for all 30 MLB squads as training camps open. Not really for some though. For the first time in 113 years, the Houston Astros enter a new season as the defending World Series Champions. A year after they lost to Kansas City (3-2) in the 2015 ALDS, the Stros' missed the playoffs in 2016 prior to a magical ride to their franchise first MLB Championship. Houston looks to buck a 17-year trend that features zero repeat WS Champions. Winning two in a row is elusive as the Yankees 3-Peat (1998-2000) was the last time a Champ scooped a double-dip. During the last 17 season finales, starting with the Arizona Diamondbacks 2001 win, 12 different teams have claimed the title. San Francisco and Boston have three each while St. Louis has a two. We'll discuss prices soon but we are not enamoured by any of those three squads. Five different teams have won the past five Fall Classic fights. Young and strong, Houston is built to tear into those trends as their Championship squad returns almost fully intact. Bookmakers Note: LIVE standings updates will appear here once the 2018 MLB action begins. Depending on where you shop, Los Angeles or Houston were top MLB 2018 World Series chalk shortly after the Stro's 2017 WS113 celebration kicked into gear. Losing value rapidly, New York's World Series line fell from +1100 to +500 when the 2017 AL and NL Home Run Champions were united as the Bronx Bash Brothers. Defending NLCS winning Los Angeles Dodgers have joined the Yankees on the top favorite perch and Houston is only 50-units behind in third. A thin Mackenzie King is all that separates Boston, Cleveland and Washington in the four through six favorite slots. Middle of the pack chalk are eclectic and a few will see line moves prior to Opening Day. Largely due to the arrival of Yu Darvish (what) the Cubs have moved into the mid-tier lead followed by the Giants and Angeles who are well back but close to each other. LF Marcell Ozuna, who hit 60 big flies as a Miami Marlin over the last two seasons, has St. Louis (+2000) group leaders ahead of the D-Backs, Mets and Toronto. Things seems to be settling somewhat and many of the Blue Jays are returning to their Rogers Center nest. Milwaukee and Minnesota round out the top 15 favorites. With 15 squads ahead of them, and those top clubs fighting for just ten playoff party tickets, the bottom half of the league has their work cut out for them. On the fringe of the mid-tier chalk, Seattle is about the only team we can lean towards. Colorado had a nice run last season but they have another steep climb the NL West. We get that Atlanta is young and "cute" pup this season but we are not walking with that big dog yet. A litter of eleven have already been tagged with a (+10000) money line and the Tigers are runts of the pack with a +20000 biggest underdog price. San Diego luring Eric Hosmer out of Kansas is another blow to the Royals after Lorenzo Cain bolted to the Brewers. The Padres have been busy and are a team worth watching during spring training. The Athletics, Rays and Pirates may tease at points during the season - though even a Wild Card spot seems like a reach. Philadelphia and Texas flashed at points last season but they have tough rows to hoe in the NL East and NL West. Baltimore is in turmoil, from the top of the front office on down, and we are monitoring the Manny Machado sweepstakes closely - the Jays should as well. Saving the last for last, Miami is not a playoff team and they do not deserve to be the +10K Club leaders. They switch spots and become top dogs (+50K) over Detroit on the CSB MLB futures board. While some are saying, trust the new Miami team ownership group, Sadly, the late Bob "Voice of God" Sheppard won't be announcing "Now batting for the Miami Marlins, pause, the shortstop, pause #2, pause, Derek Jeter at Marlins Park. Getting rid of your best two (by far) run producing hitters is weird and whacky stuff. We are tracking the South Beach Boys win total prop. StatsGuru will always have a kinship with the current SIA mutts. Detroit is kicked around but it is a sports Mecca and the true home of Rock & Roll. Plus it has amazing restaurants and beautiful sandy beaches are a short drive away. When very young, we received full size Louisville Slugger Tiger bats when Dad took us to "Bat Day" at the corner of Michigan & Trumbull. For sentimental purposes, plus being sacrilegious not to do so, we will be skipping our next slated sports bar visit to buy Tigers ALC Division, ALCS and World Series tickets. 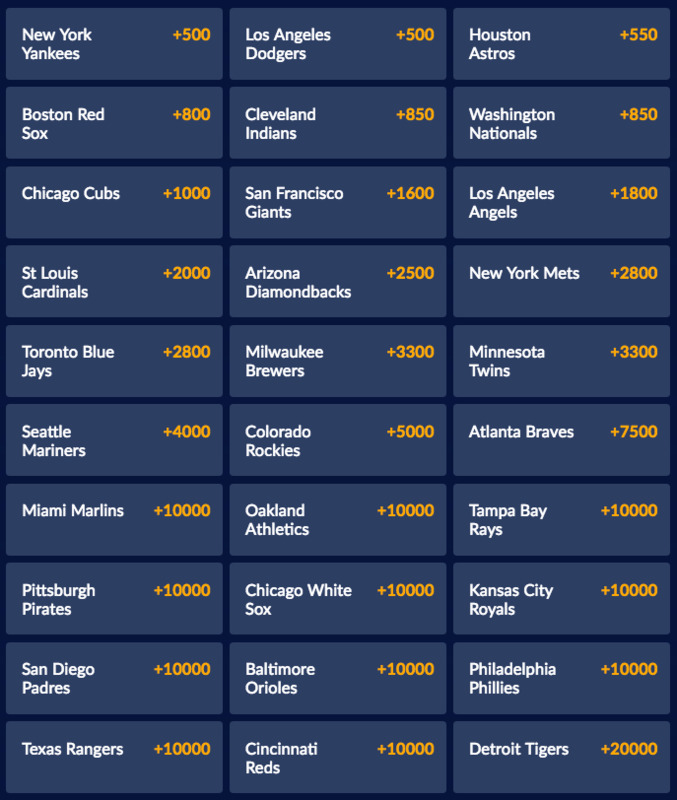 We'll be following the prices at these MLB betting specialists.